The culture of Greece has evolved over thousands of years, beginning in Mycenaean Greece, continuing most notably into Classical Greece, through the influence of the Roman Empire and its successor the Byzantine Empire. Greece has a continuous history of native dances reaching from antiquity till the modern era. It began in the Mycenean period. Greece is one of the few places in Europe where the day-to-day role of folk dance is sustained. Rather than functioning as a museum piece preserved only for performances and special events, it is a vivid expression of everyday life. Occasions for dance are usually weddings, family celebrations, and paneyeria (Patron Saints' name days). Dance has its place in ceremonial customs that are still preserved in Greek villages, such as dancing the bride during a wedding and dancing the trousseau of the bride during the wedding preparations. The carnival and Easter offer more opportunities for family gatherings and dancing. 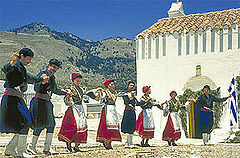 Greek taverns providing live entertainment often include folk dances in their program. Regional characteristics have developed over the years because of variances in climatic conditions, land morphology and people's social lives. In later years, wars, international pacts and consequent movement of populations, and even movements of civil servants around the country, intermingled traditions. People learned new dances, adapted them to their environment, and included them in their feasts. Kalamatianos and Syrtos are considered Pan-Hellenic dances and are danced all over the world in diaspora communities. Others have also crossed boundaries and are known beyond the regions where they originated; these include the Pentozali from Crete, Hasapiko from Constantinople, Zonaradikos from Thrace, Pyrehios from Pontos and Balos from the Aegean islands. The avant-garde choreographer, director and dancer Dimitris Papaioannou was responsible for the critically successful Opening Ceremony of the 2004 Olympic Games, with a conception that reflected the classical influences on modern and experimental Greek dance forms. Hi how is this related to the writing service reviews? These writing services reviews in this article are helpful to all students and every new essay writer. Because, these essay services are so much helpful for them and every people. So, I am very happy for using these online educational service for my best education. Thank you so much Andriani for your contribution. I enjoy that you wrote about dance.